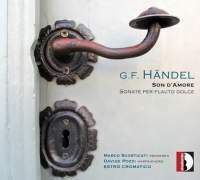 The title of this disc is taken from the aria “Son d’amore” from George Frédéric Handel’s 1726 opera seria Alessandro, but the subtitle, “Sonate per flauto dolce,” actually indicates what it is all about, and that it is filled with Handel’s alleged music for recorders and continuo—or so it might seem. The sonatas recorded are all taken from the op. 1 collection of 12 works published by John Walsh in 1732 (not 1724–26 as the notes state, citing an old Early Music article from 1985). Here, the original is generically titled “Solos” for either the “German” (probably traverse) flute or violin, and itself is a “corrected” reprint of a 1730 edition which Walsh published under the name of a Dutch publisher who had died in 1722. Despite the title, these were meant to be generic compositions rather than idiomatic ones, and although they are better designated as to instrument internally, it is clear that this was a means by which Handel could earn some cash by creating works that could be performed in amateur settings on whatever instrument one happened to have at hand. Of course, five sonatas that are brief and to the point would hardly fill a disc, so the recorder player Mario Scorticati provides a rather odd hodgepodge of other works. Three of these are drawn from the operatic arias, all being, as the French say, “recueils” or arrangements of popular Handel excerpts scored for some melodic instrument and continuo so that amateurs could perform them in polite company. Walsh published the bulk of these, and in the case of “Lascia ch’io pianga” from Rinaldo, we actually know the arranger, William Babell (1690–1723), who was a continuo player at Lincoln Hills Theatre in London (as well as an organist). His main purpose was, as might be imagined, to make money off of the popularity of the works, but in any case Handel had little or nothing to do with such things. The same can be said for the duo recorder concerto, which was cribbed from Handel’s concerti grossi, this time by Johann Schickardt (1682–1762), a composer from Braunschweig. Why he published these and other paraphrases in England can be explained by the fact that Braunschweig (called most frequently Brunswick) was under the rule of the English Hanoverians. A final piece of filler, a “Preludio” in F Major, seems completely out of place. The notes list it as HWV 426, but that work is an A-Major keyboard suite; it is not mentioned how or why this work was included here, or where it came from. Add to this the fact that much of the music is, as the notes say, “improvised” and arranged, and one has at hand a rather odd bunch of pieces, most of which don’t really have a direct connection to Handel, save via the publisher Walsh. The recorder sonatas have of course been done before and in excellent renditions, on Harmonia Mundi in 1995 with Ton Koopman and on RCA Red Seal in 2005 with Michala Petri, the last of which I would regard as the model against which all others must be compared. This disc too includes the three other recorder sonatas that were added by Frederick Chrysander in his edition of the works, though there continues to be some doubt in matters of authenticity. The works themselves drawn on other music by Handel, so the well-known issues of his borrowing are especially evident here. Each of these works consists of a five movement “suite,” each of which is short and succinct, just the sort of thing that one might expect of amateur performers whose attention spans and stamina were minimal. They conform to the pairs of slow-fast movements, into which an additional dance has been inserted as the penultimate one in two of them, the C-Major and D-Minor works. The paraphrases are all occasional pieces that have no great musical content, being pleasant enough but lacking the power that opera can give them. They are, in a word, somewhat dull from a musical standpoint and therefore something special is needed to bring them to life. There are some good things to say about the recording. Scortficati is a solid player with good intonation and sense of tempo, while Davide Pozzi is a good accompanist, being discreet enough to remain present but not overwhelming the recorder. That being said, I find the performances extremely cautious. Perhaps that is what was expected of the players of the period, but what comes out is quite sedate, especially in comparison with, say, the Petri recording. Even in the faster movements, such as the second C-Major Allegro with its half-hearted attempt by Handel at some simple counterpoint, the pace is lacking energy. I would call it more archival than gripping, and while one cannot expect such rather simple pieces to be models of virtuosity or technical achievement, perhaps a bit more attention to phrasing and contrast would have brought out the nuances. If one is interested in the general paraphrases of the arias, then this recording might serve to point out what the genteel household might have enjoyed during the 1720s, but there are better recordings of the sonatas that this one.